About 13 million Americans need long-term services and supports (LTSS), and nearly half are adults younger than age 65 who have a wide variety of disabilities and LTSS needs. However, our understanding of the characteristics and needs of the LTSS population is largely derived from studies of people age 65 and older. We have very little information on the LTSS needs of this younger adult population. This gap in knowledge between the older and younger adult populations has contributed to a disproportionate focus in policy and programming on the LTSS needs of older Americans and makes it difficult to build an effective case for improvements in service delivery and financing of LTSS for adults under age 65 with disabilities. 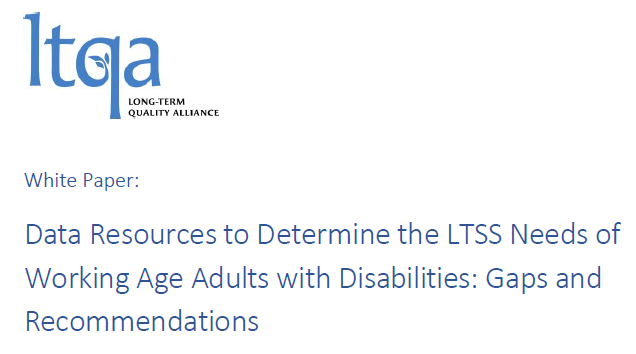 With the support of a grant from the Commonwealth Fund, LTQA has completed a research project to identify specific data gaps concerning the extent and diversity of LTSS needs and usage of adults under age 65, and to make recommendations for filling these gaps. After conducting an environmental scan of currently available data resources, interviewing experts in the field of data and research related to adults under age 65 with disabilities, and convening an advisory panel of stakeholders, we have summarized our findings and recommendations in this White Paper. Policy strategies for obtaining missing data.